Kung Fu, the new play from David Henry Hwang, the Tony Award-winning author of M. Butterfly, introduced audiences to a Bruce Lee they probably don’t know. Fusing dance, Chinese opera, martial arts, and drama into a bold, new theatrical form, Kung Fu showcases Lee in his journey from troubled Hong Kong youth to martial arts legend, husband, and father. WorldStage supported the production with projection and playback equipment during its world premiere at New York City’s Signature Theatre. 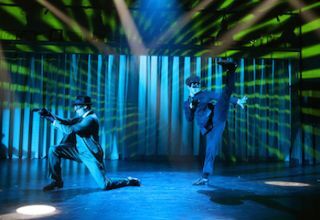 A scene from "Kung Fu" featuring production support from World Stage. Maloney’s diverse array of animated projections transformed the martial arts studio set, featuring concrete-like side walls, wood paneling, cinderblocks, and an archway into a back room, into a backdrop for many scenes from Lee’s life. A proscenium arch, projected around the arch in the set, added grandeur to a Chinese opera sequence. Shadows of telephone poles and other exterior elements created a Hong Kong alleyway for a street brawl. Vintage ’60’s graphics and a show open styled on The Green Hornet TV series recreated Lee’s American TV debut. And training drawings, based on Lee’s diagrams of martial arts moves, accented his amazing athletic ability.